Our Brass Lip and Base Straight Two Line Pewter Tankard Half Pint measures 5.51 inches tall by 3.14 inches wide. 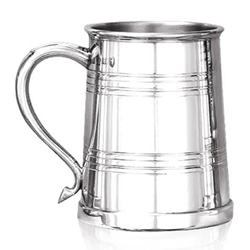 For the perfect combination of substance and style, look no farther than this one pint Stuart style heavy weight pewter tankard. Manufactured using thicker gauge metal, this tankard is significantly heavier than a standard version and produces a really satisfying feel when used. The simple straight sided body of the tankard is beautifully styled with horizontal line and grooving detail, which combines perfectly with the elegant swan neck style handle to give an impressive overall appearance. The mirror-like finish of the this tankard adds an even more striking effect.